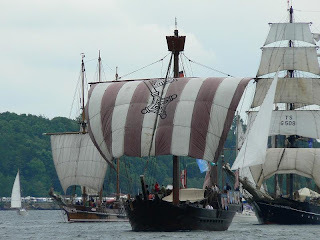 Place: The land of the Vikings, Kiel on the Baltic Sea. Denmark, Norway, and Sweden had long ago slipped from the front ranks of world power. Denmark was one of the loosers in the Napoleonic Wars. This treaty got them out of the wars. They ceded over Norway to Sweden but the decendents of the Vikings had other ideas. Norway declared independence and the Swedes weren't able to stop them. As part of the deal, Sweden gave control of Pomerania on the south coast of the Baltic to Denmark but Prussia promptly grabbed that land for itself, leaving the Scandinavians with nothing. Scandinavia remained a land of snow and forests. People sheltered in their wooden houses and looked to the seas for fishing and trade. Pictured are ships during Kiel Week. (CC) VollwertBIT.